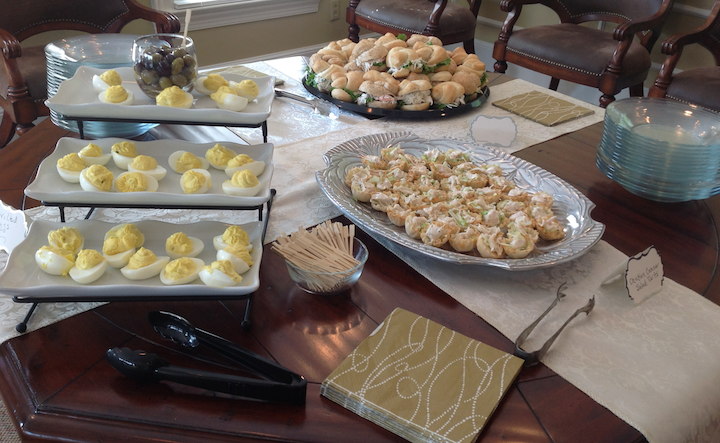 If there’s one thing every Southern woman knows, it’s that when tasked with hosting a bridal shower, a hostess has got to be on her a-game. From the invitations to the party favors, every detail has to be thought out. Nothing is too precious, cute is a fair game, and the food and drink have to be delicious. We know the gaggle of guests will gossip about the choice in napkins, munchies, party games…well everything, because it’s just what Southern ladies do. But don’t worry. We at Pretty Southern have watched our mamas, aunts — and your mama’s friends who are also “aunts” — do this for years. Here are 10 tips for hosting the perfect pretty Southern shower. 1. You don’t have to do it alone. For this recent event, all the groom’s aunts banned together (there were five total) to host the shower. 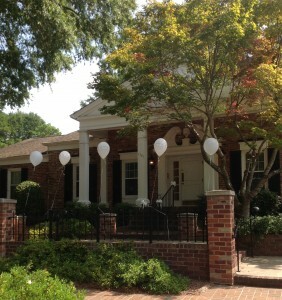 It was truly a team effort including help with the preparations, event planning, and of course the costs. This shower split five ways was fairly economical thanks to a few penny-pinching ideas. Paper doilies, fake (recyclable) rose petals, and framed pictures of the couple make easy decorations. 2. Find decorations from your local dollar store. 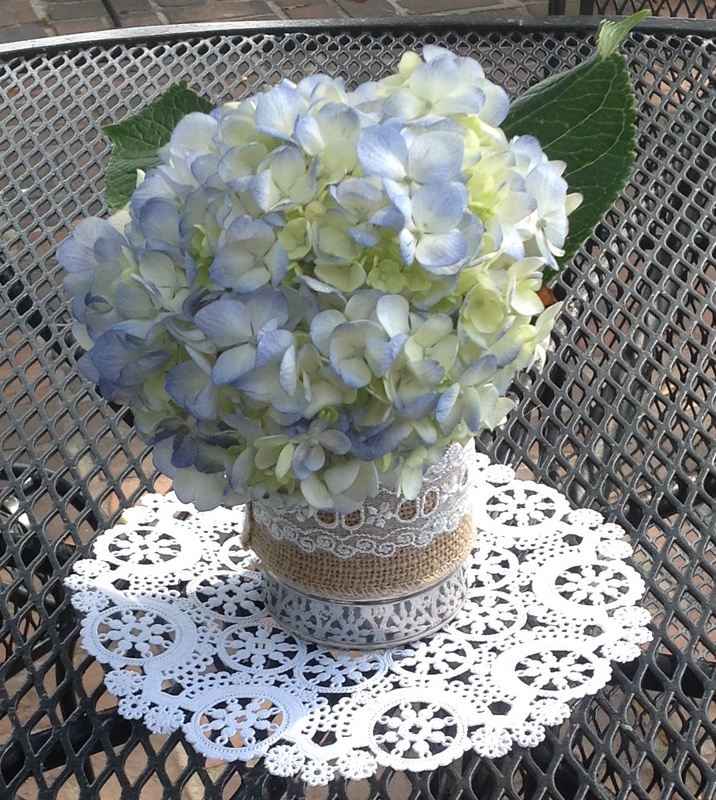 Paper doilies are so under-rated. 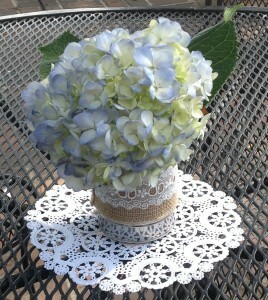 They can add a little loveliness to an otherwise plain table. Fake flower petals and bouquets (when positioned correctly) can be precious, as are the paper bridal dresses. Check out your local gift/stationary store for Bride & Groom Christmas ornaments which can serve as a decoration, as well as a gift for the happy couple. 3. Place pictures of the couple throughout the event space. 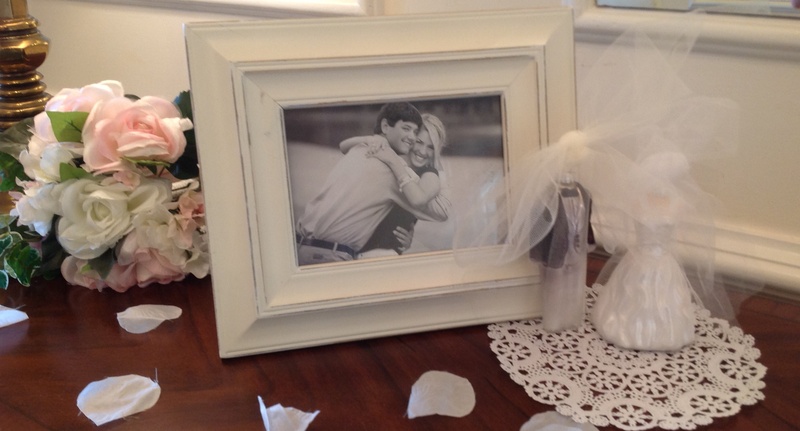 For this shower, we were lucky that the groom’s mother had framed a few of the engagement photos. 4. A dessert section is a sweet treat. 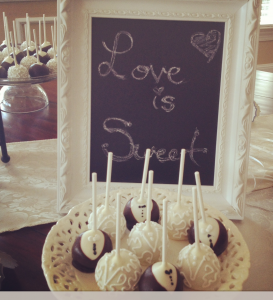 We opted for cake pops from Gabriel’s bakery in Marietta, Ga., frosted to look like wedding attire. The bridal pops were red velvet (our bride’s favorite flavor) and the groom’s with black bow-ties were chocolate, and with white bow-ties were a yellow cake. Along with the cake pops, we also picked up mini cupcakes. 5. A framed chalkboard add’s a touch of kitschy cuteness, plus you can reuse this piece again for other parties just by writing a different message. 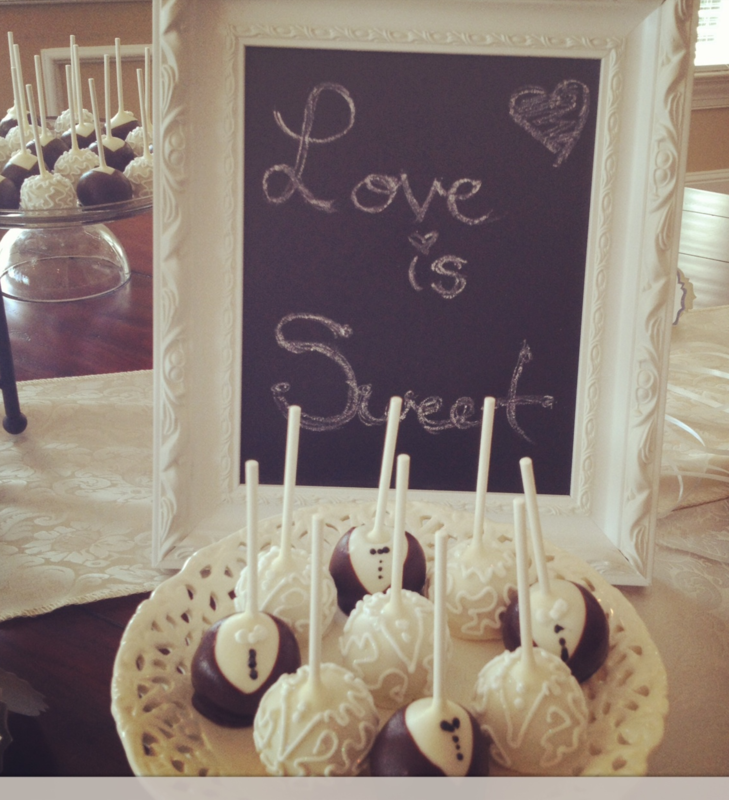 We thought “Love is sweet” worked well for our dessert table. 6. Call your local grocery store at least two weeks in advance to reserve your flowers. The Fresh Market came through for us with these lovely hydrangeas (Momma is particularly proud of this centerpiece she made). 7. Old tin cans make excellent (and cheap!) centerpieces. All you need is burlap, ribbon, scissors and a hot glue gun to create these crafts. 8. Keep the food simple. Bridal showers, as well as baby showers, are held in the afternoons so most guests might have eaten lunch. We saved on time by ordering some platters from The Fresh Market. Our menu for this event included. A perfect menu for a Southern bridal shower. 9. For the drinks, provide sweet tea, water and wine. 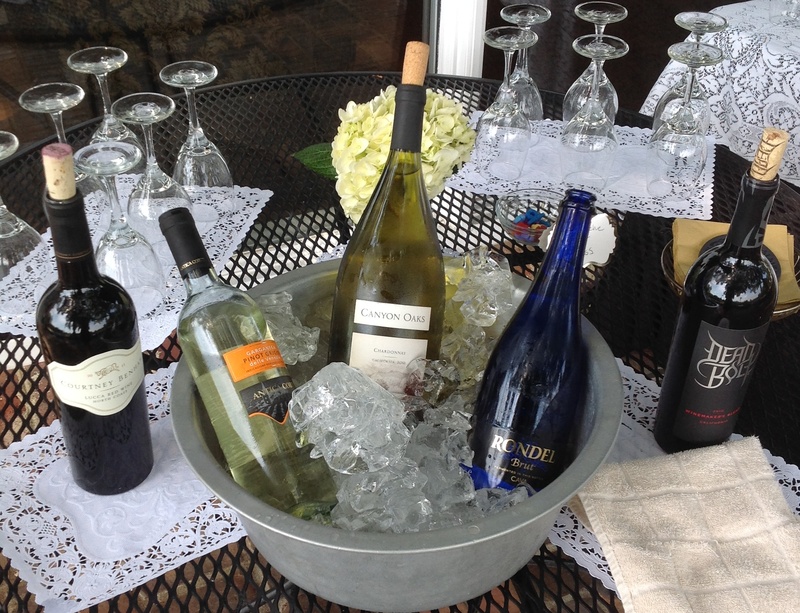 Of course you can go all out for a bellini bar (or a “Fruity Screwy Vodka Bar like Katy Ruth Camp created) but for this event we kept it easy with a selection of three whites — Champagne, Pinot Grigio, and Chardonnay — plus two reds: a Cabarnet and a Merlot. 10. For your party supplies, you don’t have to go to a department store for your linens. We scored the tablecloths at Michael’s, as well as the party napkins. Momma also has this glass pitcher stand as a party staple (pictured with Arnold Palmer) and she was pretty proud of her table scapes. For more Southern loveliness, follow Pretty Southern on Twitter, Instagram and Pinterest. We’re here to help plan your next pretty Southern shower!